(October 30, Colombo, Sri Lanka Guardian) In these most heated debates on accountability in Sri Lanka, some truths are more self evident than others. While all previous administrations nervously tiptoed around questions of accountability and only displayed one or two prosecutions as best practices, this Government delights in showing its total contempt towards even minimum adherence. Drug dealers turned politicians are protected by their political patrons, unexplained murders, assaults and rapes go by the board and a university student leader from the North this week joins the list of those brutally assaulted by goons for which there will surely be no proper investigation let alone prosecution. Let us also not forget the family members of those disappeared in 2009 who continue to plead that the lists of those being kept detained in barred government camps be published. What indeed is the point of the upcoming report of the Lessons Learnt Commission when its interim recommendations have not yet been implemented? Moreover, the capture of state assets by a ruling family exceeds even the excesses of the past, valuable state land is up for grabs by all and sundry and now, bills are not only kept secret but they are apparently not being drafted by the Legal Draftsman’s Department. The fact that there are Sri Lankans who are quite happy with this state of affairs speaks to their own credulity if not culpability rather than anything else. It is important however to remind ourselves that this blanket denial of accountability did not come about overnight. The psychological breaking down of a public demand for justice and for an independent judiciary was quite gradual in its making. It is quite ironic that former Chief Justice Sarath N. Silva should complain now that the Parliamentary Select Committee appointed to look into his conduct while as Chief Justice is not legal. Certainly it is not legal but should he be so surprised given that his Court (1999-2009) was unpleasantly distinguished by having the most number of allegations of judicial impropriety leveled against it in the entire history of Sri Lanka’s Supreme Court? From the barely judicial, (if not the most entirely un-judicial), to the wholly illegal is but a small step after all. This was not, of course, always the case. In early 1998, this columnist was part of a legal team which took the case of an engineer of Tamil ethnicity who had been stopped at a prominent check point in Colombo and arrested primarily due to the fact that he had stuttered while answering suspicious army officers, to court. His professional credentials and absence of actual grounds for suspicion did not serve as safeguards. In response, the Court acidly castigated the officers responsible for the arrest and detention, (Gnanamuttu v Military Officer, Ananda and others,1999 2 SriLR 213). Cases of this nature were common during that period and the quality of justice was entirely unaffected by the ethnicity of the petitioner. Instances of the torture of Sinhalese petitioners due to the rampant indiscipline of the police and the torture or disappearance of persons of Tamil ethnicity due to alleged links to terrorist activities were met with equally stern responses. These were excellent legal standards laid down in regard to state accountability and they were consistently followed by judges. It has always been the strongly argued premise in these column spaces that if Sri Lanka’s judiciary had not been subjected to such severe internal undermining and demoralizing during the past decade, there would have been an unwavering moral legal core that would have remained basically intact despite all the encroachment even by an apparently invincible post war executive. Recognising this fact is key to any discussion on accountability. Indisputably this justice process needs to be primarily driven by Sri Lankans across the ethnic divide and united in their conviction that nothing is more important to their collective survival. Despite all the disquieting signs to the contrary, such awareness does exist. It only needs to be slowly coaxed into open public solidarity. Meanwhile, at a different but important level, there appears to be an extreme disconnect between varying public perceptions of what accountability means to Sri Lankans in the post war stage. To Arunachalam Jegatheeswaran, (an LTTE ‘sympathizer’ as introduced on Lateline, Australian Broadcasting Corporation, 25th October 2011 though government news reports called him a known LTTE operative) who filed a suit in Australian courts against Sri Lanka’s President Mahinda Rajapaksa, accountability appears to be limited purely to holding the Government responsible for the deaths that took place during the last stages of the conflict. 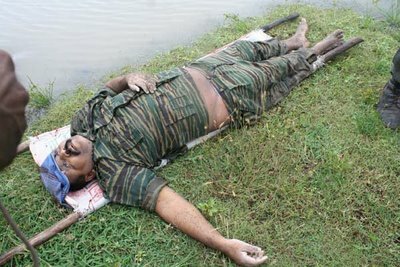 Post 2009, the LTTE appears to be whitewashed by these individuals of its murderous complicity in killing its own civilians. The Australian Attorney General’s predictable dismissal of Jegatheeswaran’s suit led to jubilant outpourings on the part of some here. Most comically, representatives of one Sinhala extremist organization were seen handing over a bouquet of flowers to the Australian High Commission in thanks while the Ministry of External Affairs issued a statement, ‘welcoming’ and ‘appreciating’ the Australian Government’s stand. In the Sinhala media, it was yet one more mark chalked up for a ‘smilingly’ victorious President, strengthening his apparent aura of invincibility while the Tamil media expressed concern regarding Sri Lanka’s international isolation. With the ratcheted up levels of animosity on both sides, whatever sanity left in public debate decreased even more. Is this what we need right now? In principle, there is no doubt that going beyond Sri Lanka’s shores to demand accountability has come about as a result of the perceived and real failures of local justice. These efforts are not all that new. From ten years back, Sri Lankans of all ethnicities and including a journalist, a teacher of English, a parliamentarian, detainees under terrorism laws and family members of those who had ‘disappeared’ increasingly sought refuge in filing individual communications under international treaty obligations that Sri Lanka had taken on. These efforts did not stop with the 2006 retrogressive Sinharasa decision handed down by the former Chief Justice. But ultimately the truth as to what happened in Nandikadal has to be part of a larger and more inclusive process of justice in Sri Lanka based on the Rule of Law and seen to be equal in effect to all Sri Lankans. International support, when offered sensitively, is useful. On the other hand, grandstanding in foreign jurisdictions by LTTE sympathizers or operatives as the case may be, achieves precisely the opposite effect. Indisputably this justice process needs to be primarily driven by Sri Lankans across the ethnic divide and united in their conviction that nothing is more important to their collective survival. Despite all the disquieting signs to the contrary, such awareness does exist. It only needs to be slowly coaxed into open public solidarity.